Spending time aboard a sailing yacht is great fun. Otherwise, we would not like it, would we? As soon as we decide to charter one for our sailing holidays, we usually start thinking about the destinations we would be able to sail, the sights we would be able to see, the beaches, restaurants and bars we would be able to visit. None or very few of us would think about limiting factors that always go together with planning a sailing trip. One of those are onboard water supplies and consumption of water. 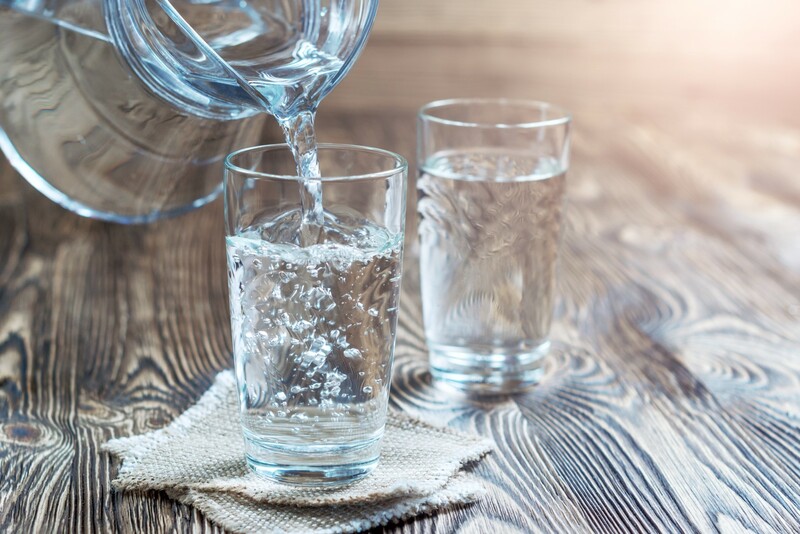 When at home, very few of us would consider water consumption, especially in regions where it does not make a large part of monthly households bills. There is nothing better than a hot shower in winter or after physical activities. However, the capacity of fresh water tanks and daily water consumption on a yacht is one of the priorities when planning the sailing trip. Why? 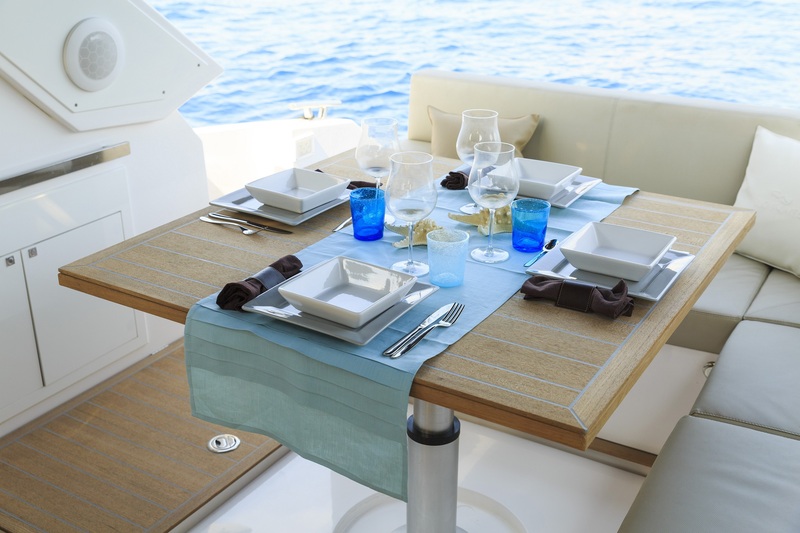 Water supplies aboard a sailing yacht are not indefinite. When you read this text, it seems self-explanatory, but you would not believe how many people find themselves helpless when they realize that they have spent few hundreds of litres of fresh water in only one day of sailing. Usually they start searching the charts and pilots looking for the closest harbour that provides fresh water. Sometimes it is quite a problem because commercial ports and marinas are usually completely full in popular sailing destinations, especially during the high season. Worth mentioning is that you are able to use shower facilities in marinas if needed. Furthermore, in some areas water supplying shortages may occur in high summer season and after long terms without rain. Visitors of Vis Island in the Croatian Adriatic experienced such a situation in summer of 2017. Not a pleasant situation at all. So, let me offer a few tricks how to save fresh water, and extend your sailing legs without visiting ports and marinas if you did not intend to. Reduce your time spent under the shower along with the number of showers per day. One of my clients tried to convince me that our fresh water tank was leaking a few years ago. The tank was in perfect condition, but my clients used to sing opera while taking a shower – three times a day, every one of them. I think you get the point – the technique of taking a shower aboard a sailing yacht considers just wetting the body with running water, putting shower gel and rubbing the body and hair without running water, and finally rinsing out with water. 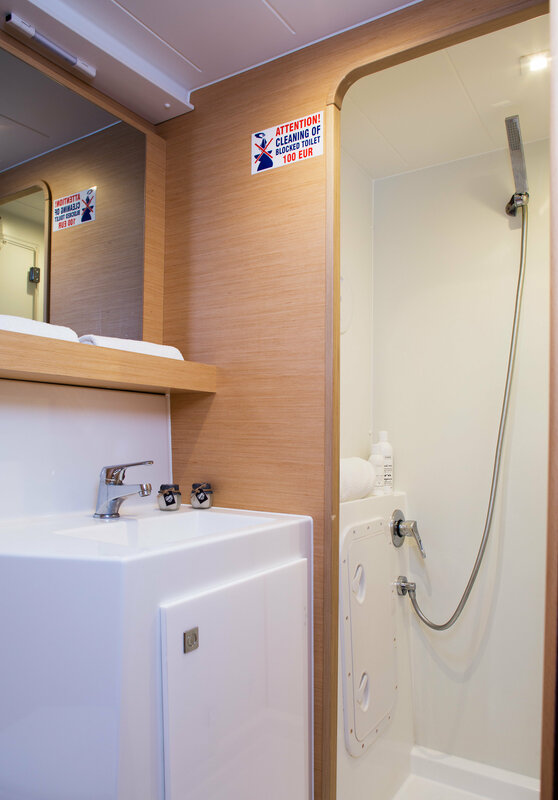 Since bathrooms aboard many sailing boats are quite small, many people take so-called open-air showers on the stern of their boats. Keep in mind that you do not have to rinse salt from your skin after every swim you take. Do it only if you do not intend to swim any more. To conclude the shower part of water consumption, there are nature-friendly shower gels available for use with salty water – wet yourself by jumping overboard, do the rubbing at the swimming platform, and jump again. Afterwards, you only need a short rinse with fresh water. When it comes to doing the dishes, the basics are the same. Try to reduce the dishes needed to prepare and serve the food. For example, you do not need a plate for each crew member if the sandwiches are served. Just one paper napkin per person would do the purpose. Many of my clients did not realize that seawater is very good diluent, so all the dishes can be washed on the swimming platform. All you need to do is to be careful not to lose the dishes in the deep waters, and rinse it with freshwater. By using this technique, not only should you save the water supplies, but protect the nature from aggressive washing liquids. Here I need to mention one more anecdote in context of saving the freshwater supplies. My clients took plastic plates and cups to be used only once, so no water would be used for dishwashing. Fine, that is a good idea at the first sight. But after two days without docking, I showed them the amount of plastic litter produced by a seven-people crew, while also mentioning the degradation time for plastic in the nature. Yes, you are right. It is about being lazy and not concerned about for water supplies.